There are a lot of superhero-themed mobile games, but none can compete with MARVEL Strike Force in terms of “roster”. 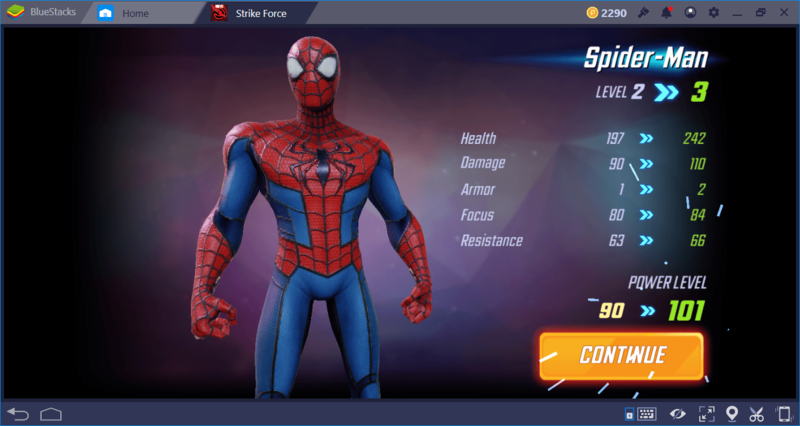 If you like both superheroes and villains equally, this is the game you should choose: MARVEL Strike Force allows you to play with almost all the characters in the MARVEL universe – even the “non-important” ones. However, the game, which is quite large and comprehensive in terms of content, can be a little challenging for beginners. 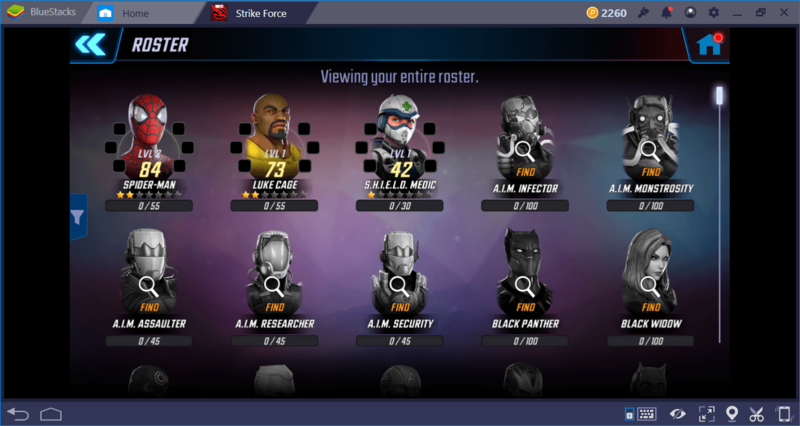 We prepared this guide for them: If you are new to MARVEL Strike Force, keep reading to find out what you need to do. 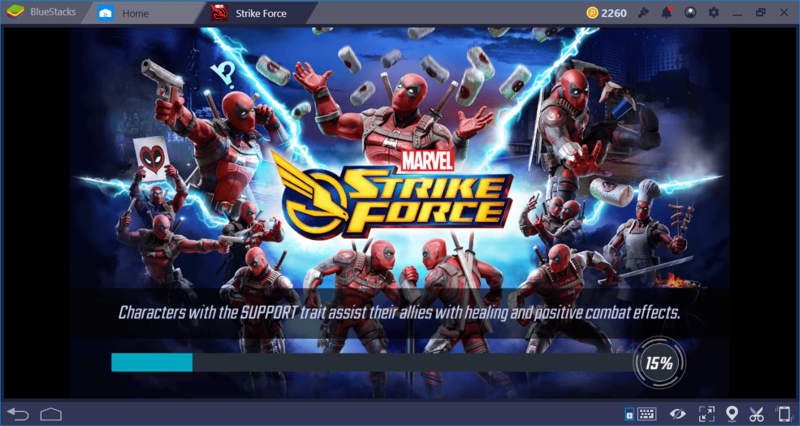 What Type of Game Is MARVEL Strike Force? 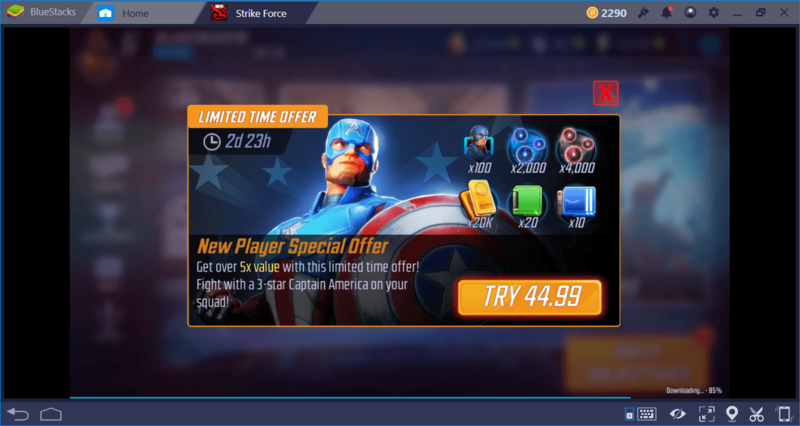 MARVEL Strike Force is a turn-based RP (role-playing) game. But we are not talking about a classic CRPG that has a slow gameplay and a story that changes according to dialogue choices. There is a story to follow but it is not possible to change it. RPG elements are limited to upgrading the equipment of your characters. Combat is so dynamic, you can forget that you are playing a turn-based game. In short, do not worry if you have not played this kind of game before: You will get used to the basic game and combat mechanics in a very short time. The size of the game is very small, you need to install 90 MB only. After starting the game, additional files will be downloaded too. The main screen of the game can seem a bit complicated at first glance, because there are many options available. 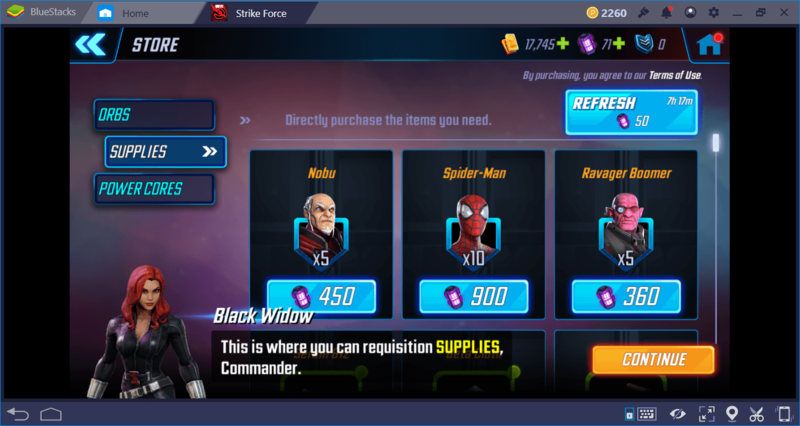 But do not worry: Nick Fury and Black Widow will show you what you need to do throughout the tutorial. MARVEL Strike Force has a fairly simple story: Ultimus is attacking the world. This attack is so violent and big that both superheroes and villains have to form up teams to fight against Ultimus. As the “commander”, you will form up these teams and lead them on the battlefield. 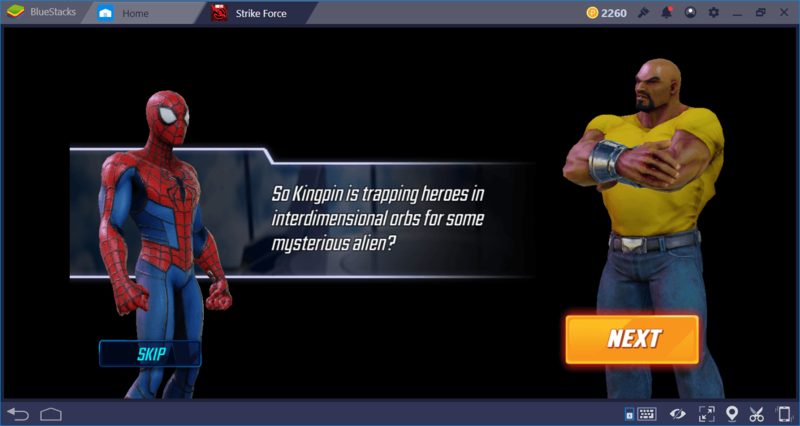 But there is a problem: Almost all of the heroes and villains are trapped in inter-dimensional orbs and you need to find these orbs in order to “unlock” them. In the beginning, your only hero will be Spider-Man and you are asked to complete a number of missions to find the remaining superheroes and villains. As tasks are completed, some characters will be automatically unlocked. For example, Luke Cage joins your team only after completing the first mission. 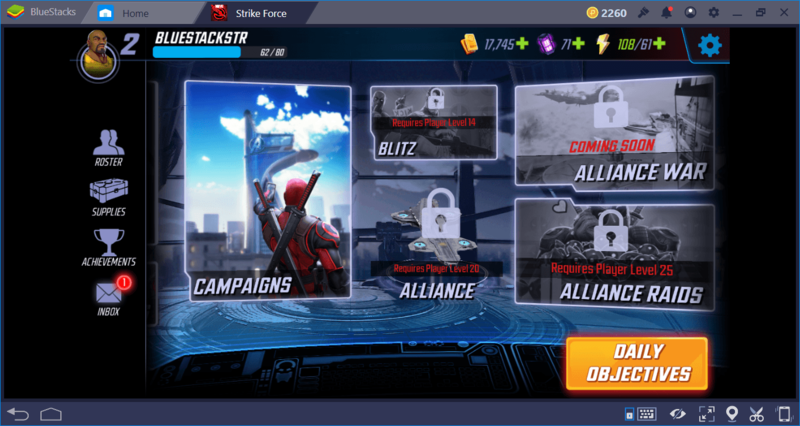 You will have to do a lot of work to unlock the other characters, because you are required to complete a large number of activities and collect their shards. Of course, if you do not want to work this hard, you can also buy them by paying with real money. 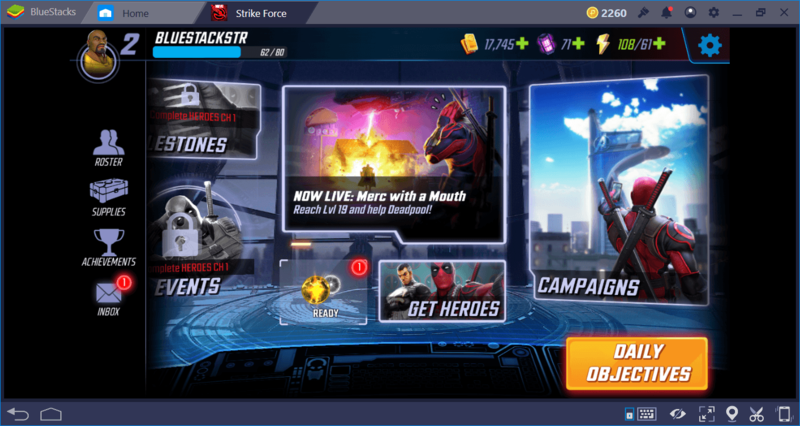 However, we will always talk about free gameplay in our guides for MARVEL Strike Force. Speaking of working hard, there are many categories of tasks that the game offers you. Campaign: You can find the tasks for the main story of the game under this category. There are a total of 9 chapters that you need to complete, and each chapter is divided into multiple episodes. At the last mission of each episode, you will fight against a “boss” enemy. Some of these battles will give “shards” that you can use to unlock new characters. You will also get prizes such as XP points, gold, orb fragments, and equipment. You can play a chapter or an episode multiple times. In fact, you must do this in order to collect the shards of some characters. 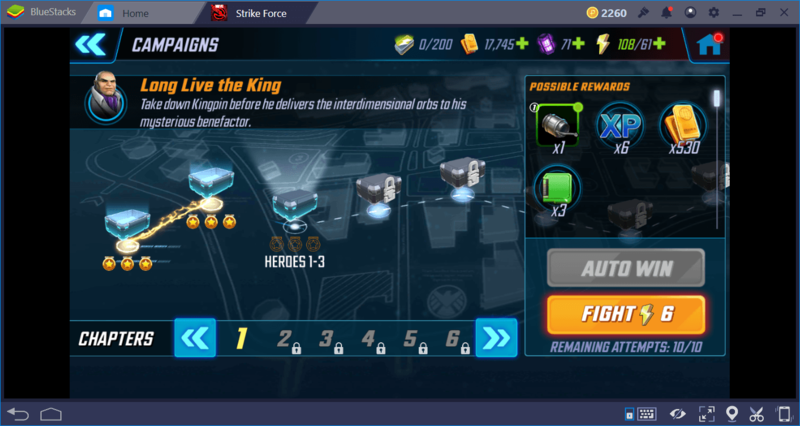 For example, Chapter 1 – Episode 6 task allows you to win 2 Punisher shards each time. By completing this task multiple times, you can unlock the Punisher and add him to your team. However, each campaign task requires a certain amount of energy. This is part of the game monetization system and we will examine it in detail in a different guide. 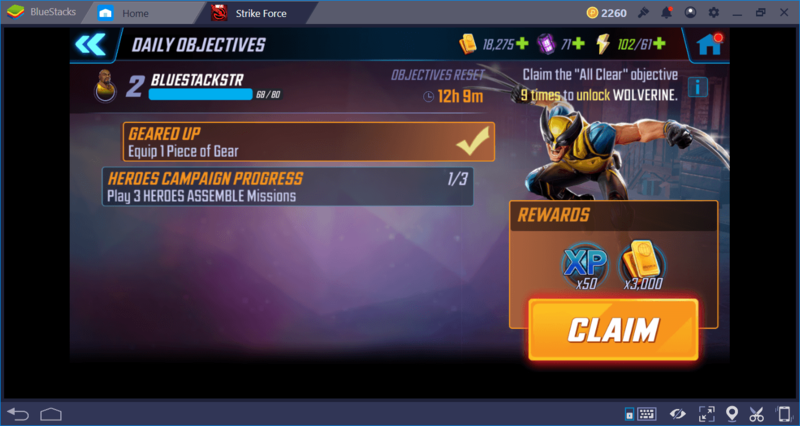 For now, know that completing the campaign should be your first priority: The faster you complete all of them, the sooner you can start farming for character shards. Blitz: This is a 5v5 arena mode in which you fight against an AI team. It becomes active at level 14. You are fighting against enemy teams that match the level of your team – there is no story, just combat. You can think of Blitz as a PvP mode that you play against the AI. Every battle you win gives you “Blitz points”. This mode consists of a total of 14 tiers and you can unlock some characters only with Blitz points. Arena: A PvP mode that becomes active at level 30 in which you fight against other players. This mode requires setting up a PvP-focused team, so it is quite different from the original game. Again, there is no story: This is a tournament in which you compete against real people. Alliance Raids: When you reach Level 20, you can join an alliance. At Level 25, the “Alliance Raid” feature is activated. This mode offers the most challenging battles and the most valuable equipment in the game. In the latest raid, you fight against Ultimus with your alliance members. This mode uses its own currency, “raid energy”. Daily Objectives & Challenges: Tasks and goals you can complete every day. For example, completing 3 campaign tasks within 24 hours is considered a daily objective. 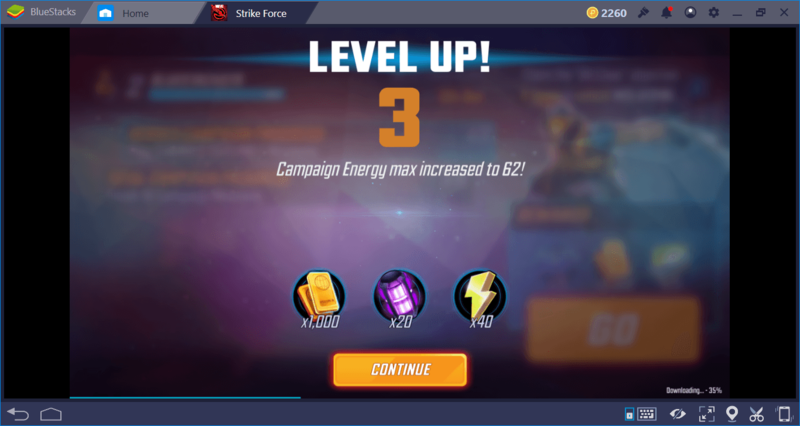 As a reward, you can earn energy, points, gold, and XP points. 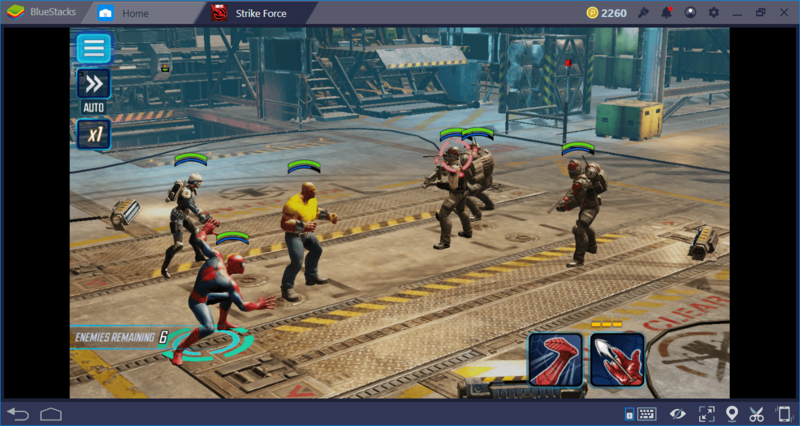 The MARVEL Strike Force combat system is based on creating a balanced team. We will provide more information on this in a separate guide, but for now, know that your team must use a “tank-healer-damage dealer” setup. You will always fight against multiple enemies and it is possible to choose which one to attack first. According to “Speed” stats, the game decides who will strike first. When it’s your turn to fight, you can attack by clicking on the skills in the bottom right corner of the screen. Each attack has a different effect on enemies based on the skills of your characters. For example, the attacks of tanks do not cause much damage, but they can gain the enemy’s “attention”. Which means the enemies will attack tanks, instead of other characters. Healers can be used to heal other team members. Damage dealers focus on quickly eliminating enemies, as they deal the most damage. After using abilities, you must wait for a certain time to be able to use them again – this is called COD (cooldown). So you have to set up a balanced team and determine in what order you will use the skills of your characters. At the beginning of the game; Spider-Man will be the damage dealer, Luke Cage will be the tank, and an anonymous SHIELD agent will be the healer. As the game progresses and new characters are unlocked, you can set up your own special team. Every activity you complete will reward you XP points. These points will be used to level up your characters and yourself. By completing various daily events and tasks, you can earn extra experience points too. For example, by sending your heroes to a “training room”, you can quickly gain more levels. Do not worry, we will discuss this issue in more detail in a separate guide. In addition, the activities you complete will also provide you with various equipment. With this equipment, your characters can gain extra skills or strengthen their existing skills. 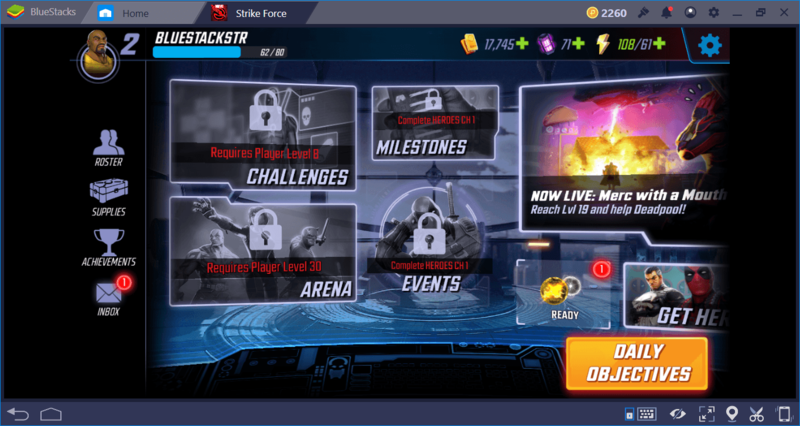 These are the basic things you need to know about MARVEL Strike Force: The game has very rich content and it is not possible for us to tell everything in a single guide. That’s why we have created a number of additional guides: Keep reading them to learn more about every of this truly MARVELous game. Good luck in your fight against Ultimus!